It’s happened to all of us: the random stranger who put an extra 50 cents in our parking meter when it ran out. The young woman who happily handed over $2 in the grocery store line when we ran short. The old man who complimented us on how lovely we look, even though we were having an awful day. You know, those sweet, wonderful random acts of kindness that lift us up and make our hearts sing with joy. Think of how you feel when someone does something for you, even if it’s something small like holding the door or giving you a sincere compliment. Don’t you just start to glow? It’s like a bright light that starts in your heart and works its way out through your smile. Kindness has the ability to change us, and our emotions, immediately. And, at a very basic, vibrational level. And, stop and think about how you feel when you do something selfless for someone else, something with no strings, no recognition, nothing. Giving pure kindness like that feels just as good, doesn’t it? Why does kindness feel so good? I’m not sure. I could go out and research it, and offer up some scientific studies on kindness and giving, and why “the doctors” say it makes us feel so good. But, that sounds pretty sterile. My opinion is that human beings are, at heart, giving, loving creatures. Helping others puts us in touch with something much larger than ourselves. When we help someone else, we’re reminded that we’re much stronger together than we are apart. We’re reminded of what it truly means to be human. That’s why giving and kindness feels so good. To me, a random act of kindness is something you do for someone else completely for them. You are not part of the equation. So, doing something for someone so that it will reflect positively on you is not a random act of kindness. And, doing something for someone and expecting something in return is not one either. An act of kindness is free. It’s given or done with a whole heart. 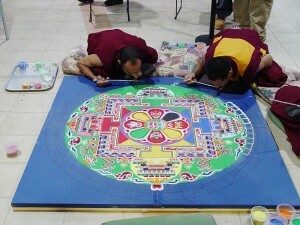 I liken it to those beautiful sand mandalas the Tibetan Buddhist monks create. 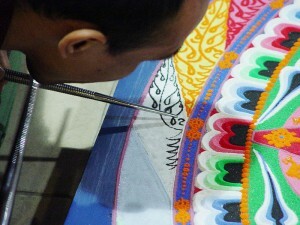 They spend weeks creating this amazing work of art out of colored sand. When the sand mandala is finished, the monks destroy it. The point? The doing, the act, is the thing. Not the gratification from the “oohs and ahhs”. Not the self-importance of completing the mandala. It might not be a spot-on comparison, but to me it makes sense. 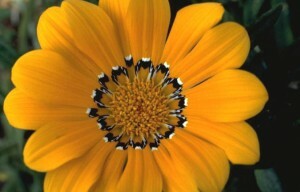 Both things, the mandala and the act of kindness, are given to the world freely. There is no ownership. Here’s my challenge: I’m urging you, yes you, to start practicing more random acts of kindness. And, I’m challenging myself to do the same. Well, I really think that kindness can change the world. Think about it: when someone does something truly nice for you, it lifts you up and makes you feel good. After that, you’re far more likely to do something positive for someone else that day. They, in turn, might do something good for someone else. And so the cycle starts. To you it might be one small thing: a cold drink of water for a runner on a hot day. Or, a sincere compliment to someone who looks like they need a pick-me-up. But who knows how far that one little act can go? There are so many wonderful random acts of kindness ideas. And if you need some inspiration, see the resource links below. Here are some quick ideas for you to mull over. Many of these were taken from Noogenesis.com. There are tons of ideas on that site, so give it a look! If you see someone asking for money on the street, buy them dinner. And if you have time, eat with them. You might be surprised at the amazing life they’ve led, and what you might learn from them. If someone you know is sick or just had a baby, why not make them a wonderful meal and take it over? Pick a random name and address out of the phone book. Write an uplifting, positive, hopeful letter or postcard, and mail it out. Bake some cookies for your local police or fire department. Buy a bouquet and a dozen helium balloons and deliver it anonymously to your local hospital. Instruct the nurses to give it to whomever needs it most. Drop some coins in someone’s garden so that when they weed, they find a surprise. If you have flowers growing in your yard, cut some and make a beautiful arrangement in a spare vase. Then, deliver it to a random person (you can leave it on their doorstep!). Buy the coffee of the person behind you at the coffee-shop drive through. Leave your spare change in the vending machine for the next person to find. Give your bus seat to pregnant women, mothers with children, and seniors. Leave some good chocolate on the desk of your co-worker. Randomly. If someone looks lost, offer to help them by giving directions. If you have a favorite book that’s happy and positive, why not leave it somewhere (on a park bench, subway, or bus) with a small note saying why it’s your favorite, and why it should be read. Share your umbrella with someone! Operation Nice– This wonderful blog is all about kindness. Melissa, the founder of Operation Nice, believes that kindness can make a huge difference in the world. And, I believe her! There are tons of ideas you can use to simply be nice to people. And, tons of readers write in with their own stories and suggestions. Highly recommend. Ordinary People Change The World– Another great blog on random acts of kindness. This blog focuses on small things you can do to help make the world a better place. The Random Acts of Kindness Foundation– This non-profit has a really wonderful website full of tips and tools to help people be more kind to each other. And if you’re a teacher, there are some really great lesson plans on how to incorporate kindness in your classroom. This site also allows you to create a website and start networking with other “kind minded” people in your area. Help Others– This is another great site devoted to kindness. There are many great ideas here. Great article! It’s not only great when someone does something nice for you, but just meeting a genuinely nice person can make you happy. They all seem like good ideas except the coins in the garden one. Speaking as a gardener I would be annoyed to find that in my garden and then paranoid as to what might have been tampered with. Yeah, I think that’s one tip I was on the fence about (no pun intended!). But, I garden too, and I figured I’d be pretty happy if I found some quarters mixed in with my cherry tomatoes and green peppers! I can understand, though, how some people might be less than enthused about it, though. You can increase your impact by creating challenges around good deeds. Try http://www.goodwillheroes.com as a fantastic free platform to do this. Watch your good network grow. The book I wrote seems to go down the same path as your concept. Even though our book may not be considered politically correct, it is written with the hope that some ideas that used to be called “common sense” will again become the behavior of choice. There is one rule presented, in a truthful yet humorous fashion” for each week of the year. Our hope is that each person will use in his/her life some of these straightforward and easily applied ideas after it is understood why they are important. Truthfully, these rediscovered actions will allow us to live together in society with as little confrontational stress as possible. Our former “lower” thinking will be replaced by the much more kind “higher” thinking. If the “kind way” does not convince the reader maybe reading the “skull” section will be needed to reinforce the lesson. I hope you enjoy our book.